Google Chrome 5's dev build has a feature that detects the language of a web page and lets you translate it without opening a new page. The feature is borrowed from Google Toolbar, but Google Chrome is the first browser that translates web pages without requiring an add-on. When you visit a page written in another language, Chrome shows an infobar that asks if you want to translate the web page. 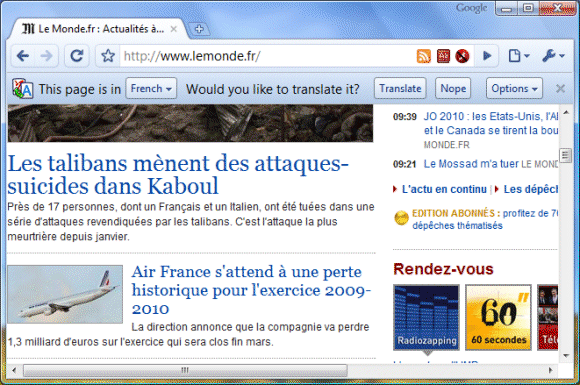 You can ignore the message, change the language that was automatically detected or translate the web page. If you click on "Translate", Google Chrome will translate the page and will no longer prompt you when you click on a link from the page. "Look for the blue translation bar at the top of the page, whenever you come across a page written in a language that doesn't match the browser interface language you've selected. Translation is currently available for 52 languages. If you choose to translate a page, the text of that page is sent to Google's translation service for translation. Your cookies are not sent along with that request and, if the page you are on is encrypted with SSL, Chrome also sends the translation request over SSL," explains Google. If you click on the "Options" button, Chrome lets you disable translation for the current language or for the site you're visiting. For now, there's no option to disable the feature or to manage a blacklist of domains and languages. While this feature is brilliant and it work for almost any web page, including web apps like Gmail or Google Docs, I'm not sure if it's a great idea to translate pages encrypted with SSL. Someone could click on the "Always translate" option and inadvertently send confidential information to Google's servers. To try this feature, install Chrome dev channel, a buggier and less polished version of Chrome, or wait until a stable Chrome 5 build is released. A similar implementation is available in Google Toolbar for Internet Explorer and Firefox. 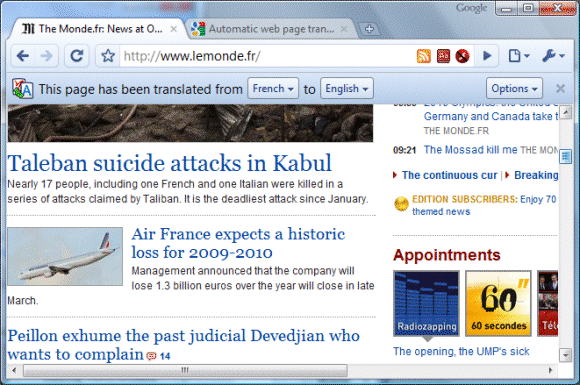 There's also a Chrome extension for translating web pages. - need an easy/clear setup to choose whether you're ok to send infos to google (should even be 2 defaults, for http/https sites). Also because I guess even if you do not click translate, it sends data to check what language the page is. Fortunately, detecting the language doesn't send data to Google's servers. It's not very difficult to detect a language, but no algorithm returns perfect results. The extension includes a button to pop up the translate bar a la Cedric's question. Thanks, Benjamin. I updated the post. Looks like it is going to make to the special 4.1 release, which will also incorporate the Content Settings feature that you discussed earlier. It will probably be released within a month or two, a beta release is to be expected soon. The language bar takes too much space. I can read several languages. If language bar stays, at least make an API call that outputs the already detected language code. I just downloaded the latest nightly build of Chromium. It now has the ability to disable the translator that several people have been asking for. how can i disable/remove/uninstall this extension? it's annoying sometimes. thanks in advance. At least in Chrome 5.0.342.5 (dev), there is a check box in Chrome settings : Options-Advanced . So you can uncheck it so that it won't offer translations anymore. Just installed the latest 5.0.... beta. Am I something missing or is there no popup translator anymore? I don't want a probalby bad full page translation, I am fine with one word translated (the one I am hovering over). The Google-Toolbar can do it, why can't Chrome? I have a msg totally in Swedish but get no offer to translate. In my settings I see no option to enable translate. I am on latest version 5.
is there any way I can disable sending my browsing information to GOOGLE SERVERS. I heard Chrome is nothing more than an information farm and my privacy is being compromised. Any truth to that?